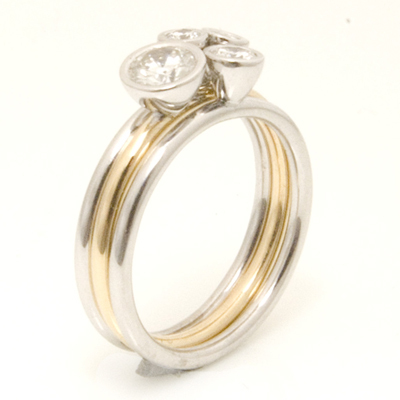 Yellow and White Gold Diamond Stacker Ring — Form Bespoke Jewellers Ltd.
A stunning yellow and white gold diamond stacker ring. You can create your own perfect combination with this yellow and white gold diamond stacker ring. Set with varying sizes of round brilliant cut diamonds and cast in both 18ct yellow gold and 18ct white gold, this is a truly versatile dress ring. 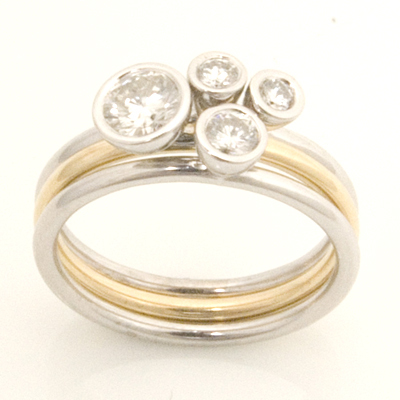 Here at Form Bespoke Jewellers, we can create a bespoke dress ring to suit your personal style. This ring could be recreated with coloured precious stones? cast in platinum or palladium? set with princess cut diamonds? The decision is yours. When you come into our Chapel Allerton showroom, you will get to sit down with one of our expert jewellers who will work with you to create your perfect piece of fine jewellery.